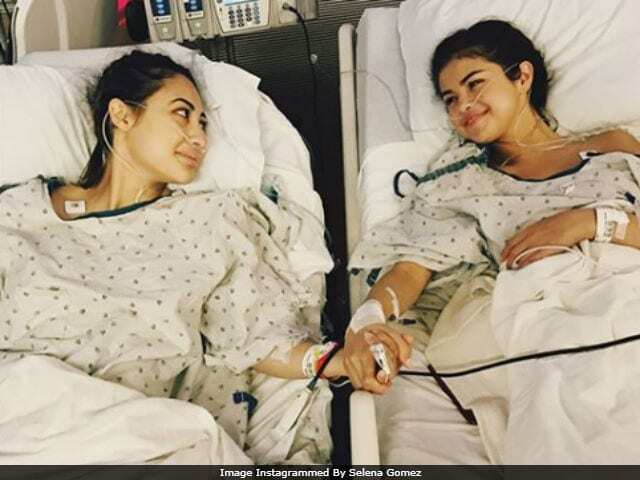 Selena Gomez dropped a bombshell on Instagram: The 25-year-old pop star had a kidney transplant earlier this summer, and the donor was a friend, actress Francia Raisa. The first photo in the post features Gomez and Raisa holding hands, lying side-by-side in hospital gowns. "She gave me the ultimate gift and sacrifice by donating her kidney to me," Gomez said of her extremely generous friend. "I am incredibly blessed. I love you so much sis." Another photo in the series revealed a large red scar across her abdomen. Gomez said she needed a transplant as a result of having Lupus, an autoimmune disease that can cause damage to many organs, including the kidneys, heart and brain. "I'm very aware some of my fans had noticed I was laying low for part of the summer and questioning why I wasn't promoting my new music, which I was extremely proud of. So I found out I needed to get a kidney transplant due to my Lupus and was recovering. It was what I needed to do for my overall health. I honestly look forward to sharing with you, soon my journey through these past several months as I have always wanted to do with you. Until then I want to publicly thank my family and incredible team of doctors for everything they have done for me prior to and post-surgery. And finally, there aren't words to describe how I can possibly thank my beautiful friend Francia Raisa. She gave me the ultimate gift and sacrifice by donating her kidney to me. I am incredibly blessed. I love you so much sis. Lupus continues to be very misunderstood but progress is being made. For more information regarding Lupus please go to the Lupus Research Alliance website: www.lupusresearch.org/ -by grace through faith." Gomez felt the need to address her public absence after fans started wondering what happened to her, especially considering she had new singles to promote. When a pop star falls off the radar - particularly when they have new work to publicize - the tabloid gossip inevitably gets going. Gomez has learned that it's smarter to simply be honest. This isn't the first time she's disappeared due to health issues. In January 2014, the singer canceled a number of concerts, and the assumption was that she had checked into a rehab facility for addiction. The following year, she divulged that she'd actually been undergoing chemotherapy after her Lupus diagnosis. Since then she's been open about her struggles with the illness. In 2016, just ahead of concert dates for her "Revival" tour, she released a statement saying that she was struggling with "anxiety, panic attacks and depression," which were side effects of her disease. "I want to be proactive and focus on maintaining my health and happiness and have decided that the best way forward is to take some time off," the statement read. Fans were delighted she was well enough to get back to the recording studio and release three singles this year, It Ain't Me, Bad Liar and Fetish. She also did press in the spring for the buzzy and controversial Netflix series 13 Reasons Why, which she produced. But with the exception of new music and the occasional social media posts, she's been out of the public eye since then. Now we know why, and according to her Instagram message, she'll offer up more details about her ordeal when the time's right. "I honestly look forward to sharing with you soon my journey through these past several months," she wrote.